Contains Vitamin E and Almond Oil that moisturises and nourishes skin. Cleanses deep inside the pores without leaving the skin parched. Effectively gets rid of all the dirt, grime, oil, and makeup and lets your skin breathe. Makes your skin soft, supple, and radiant. Additional Information: Pamper your skin with the goodness of nature, and give it that natural touch by getting rid of all harsh effects of external environment, with Blue Heaven Cleansing Lotion. Explore the entire range of Cleanser available on Nykaa. 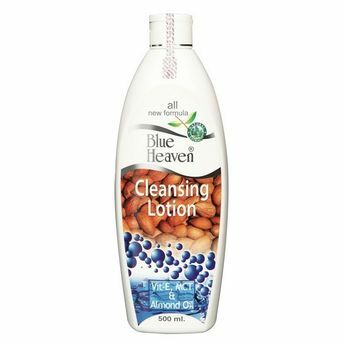 Shop more Blue Heaven products here.You can browse through the complete world of Blue Heaven Cleanser .